Bangles or Churi are traditional ornaments worn by Indian And Pakistani women, especially Hindus and Muslims. They are worn after marriage to signify matrimony. They are made of numerous precious as well as non-precious materials such as gold, silver, diamond, platinum, glass, wood, ferrous metals, plastic, etc. 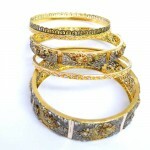 Bangles are part of traditional asian jewelry. They are usually worn in pairs by women, one or more on each arm. 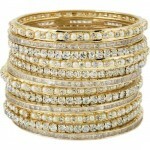 Most women prefer wearing either gold or glass bangles or combination of both. Inexpensive Bangles made from plastic are slowly replacing those made by glass, but the ones made of glass are still preferred at traditional occasions such as marriages and on festivals. 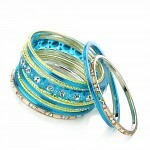 Children’s bangle bracelets are often worn by young girls who love the tinkling sound of bangles in their hands. Bangles are worn in the hands and come without any closure of clasps, therefore before purchasing children’s bracelets, it is important to try the bangle on the hand in order to ascertain if it is the right fit for the child’s hand. Bangles are available in wide variety of designs and style as there are glass bangles available in various shades, and they look great and traditional but they are not so durable. 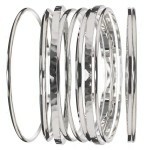 These types of bangles can easily break as they are made of glass. Some of the most amazing designs of children’s bracelets are easily available on the internet. One can easily purchase them from Asian, UK or USA stores or they are also available with wholesale retailer outlets online, and one can also avail discounted rates as well. But wholesale retailers offer discount only for bulk order. Purchasing bangles is fun and many girls like to buy bangles in all colors so that they can coordinate the bangles with their dresses. 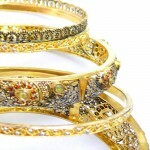 Gold and silver bangle bracelets are the most commonly used metals for children’s bangle bracelets. But the credibility of the vendor must be verified before buying children’s bangle bracelets from him.